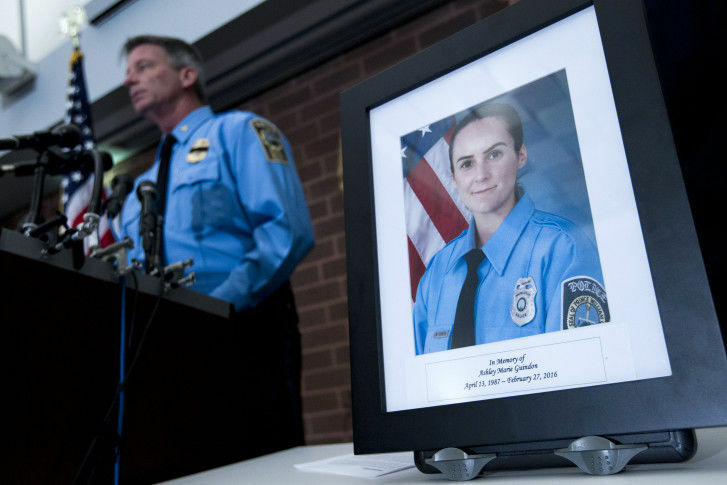 WASHINGTON — An Army staff sergeant was found guilty Wednesday of 17 charges including three capital murder counts in the fatal shooting of his wife and a Virginia police officer who was on her first shift. Ronald Hamilton, 34, of Woodbridge, Virginia, was charged in connection with the February 2016 fatal shootings of his wife, Crystal Hamilton, and Officer Ashley Guindon, who was just hours into her first shift as a Prince William County police officer. Hamilton was found guilty of three counts of capital murder: killing a law enforcement officer, killing more than one person in a single event and killing more than one person within three years. He was also found guilty of attempted capital murder of officers Jesse Hempen and David McKeown, who were severely wounded during the shooting. During closing arguments Tuesday, defense lawyers urged jurors to convict Hamilton on a charge other than capital murder. Jury deliberations began Wednesday morning. Around 3 p.m., the jury returned with a question, the Prince William County Circuit Court said. Deliberations began at 930. Jury chose foreman last night. Hamilton faces 17 counts, including 3 for capital murder, which could result in being sentenced to death. Jury could also choose lesser charges of 1st, 2nd degree murder or voluntary manslaughter. Or not guilty. Jurors heard evidence during two weeks of testimony that Crystal Hamilton called 911 after her husband struck her and slammed her to the floor. Hamilton shot her four times with a Glock handgun, prosecutors said. Crystal Hamilton’s 911 call, which ended with her pleading, “Stop!,” was played during the trial. The couple’s then-11-year-old son was home at the time of the killings. Several officers, including Guindon, responded to the call within minutes and tried to enter the house to check on Crystal Hamilton’s welfare. Ronald Hamilton refused to let them in. One of the officers then kicked open the front door, which is when, police say, Hamilton opened fire with an AK-47 rifle. Even though police say Hamilton confessed to the shootings after his arrest, he pleaded not guilty. Lawyers disputed whether Hamilton premeditated the killings, an act necessary for a capital-murder conviction and possible death penalty. Prosecutor Richard Conway said the fact that Hamilton switched to a rifle in preparation for police officers is the most compelling evidence of premeditation. Defense attorneys maintained that the killings lacked premeditation, saying Hamilton fired indiscriminately at the officers with no intention of killing them. The defense lawyers did acknowledge during closing arguments that Hamilton is guilty of the slayings. Hamilton, who served two tours of duty in Iraq, initially struck his wife during an argument over her plans to attend a Chippendales-style dance revue with her friends. Crystal Hamilton then called 911.